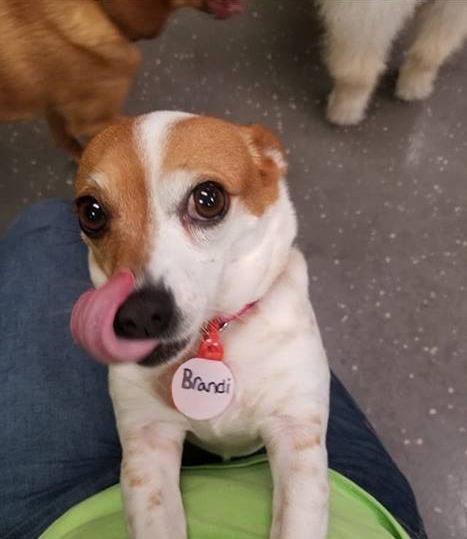 Congratulations, Brandi Astromovich for being voted Bark-A-Bout’s April, 2019 “Bark of the Month”!!! Hi! My name is Brandi Astro. 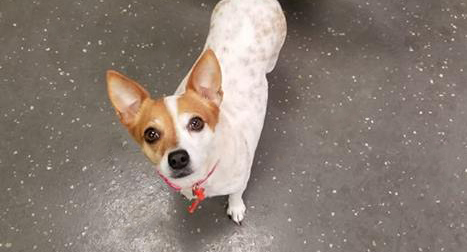 I’m a 7-year-old Jack Russel/Rat Terrier mix. I had a really hard life for my first two years, living in an abusive home where I was hurt by my owners. Then, my Mom and Dad rescued me! Now I’m loved unconditionally and living a very spoiled and colorful life! 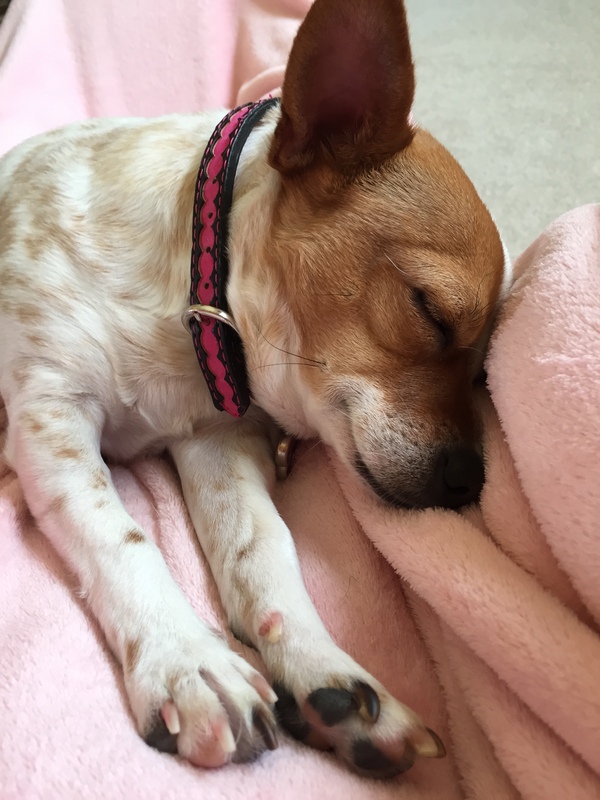 Mom says I’m her “forever puppy” because of my small little and cuddly size! My favorite things in life is the luxury of getting my belly rubbed and snuggling up on the couch with my mom in my favorite pink blanket. I love to chew on my piggy squeaky toy after Dad throws it, and I enjoy taking adventurous outdoor walks to the park. I crave being the center of attention! Mom and dad says hi have Superman skills, and that you should see how high can jump! Especially if my family has wrapper cheese or chicken. I will try to see what’s on the counter top by jumping up as high as I can! Really anything that makes the crinkly wrapper noise has me out and investigating. My human brother and sister are away at college, so that means I get Mom and Dad all to myself! I love when my boy and girl come home during breaks. I jump all over them to shower them with love and affection and then my favorite is to curl up in their beds with them because I am definitely a “lap dog!”. I love to sit on everyone’s lap and make myself right at home. So, if you come by my house, Mom says you had better bring a lint roller with you because I am going to cover you in love and fur! In fact, Mom calls me a “Velcro Dog,” because I’m always stuck to someone, whether I’m on their lap or just following them around the house. When I go out in the yard gardening with my Dad, I protect him from the evil rabbits that live out there. I’m really, really fast! I will chase them away and sometimes even try to catch them! I must keep my family safe because those bunnies can be super sneaky. I absolutely love to go to Bark-A-Bout! 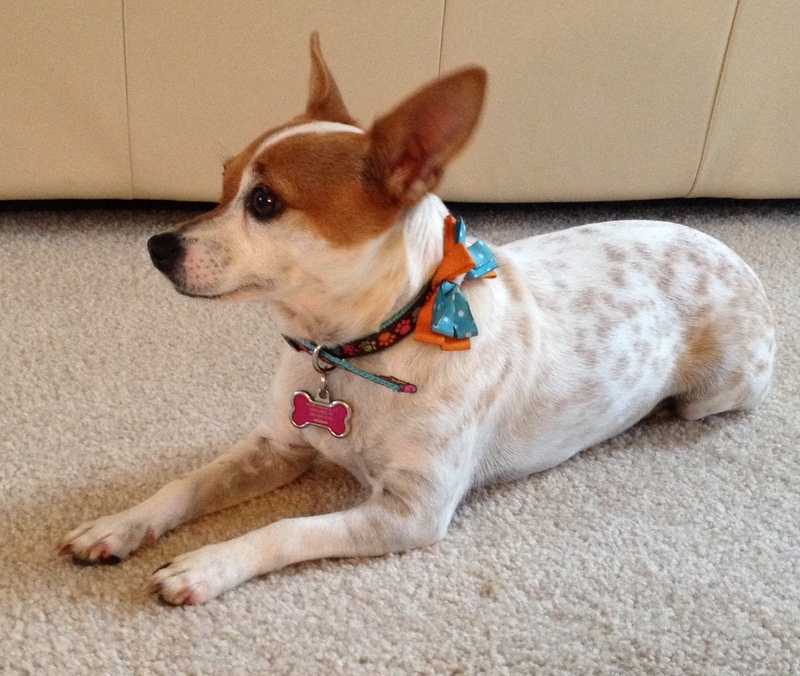 When I hear Mom and Dad say the words, “Bark-A-Bout” I get so excited! I love to go and play in Tiny Town with all my puppy fur’ends. Mom and Dad know when I’m at Bark-A-Bout, I’m being loved and cared for just like I am at home. So, if you happen to catch me on my way into our out of Bark-A-Bout, please be sure to congratulate my mom and dad on me being voted Bark of the Month. I know they will feel very special and smile really big! !